The BenQ HT1070A and Epson Home Cinema 1060 are entry level home theater projectors that are both priced at $649. Both deliver solid value for low-cost 1080p home theater projectors, and both weigh less than 6 pounds, making them comfortably portable. However, they have very different features and advantages. Only the BenQ HT1070A offers Full 3D support, for example, and only the Epson HC 1060 includes built-in Wi-Fi. But the most important differences by far are in brightness and contrast. The HC 1060 is significantly brighter, rated at 3100 ANSI lumens compared with 2200 for the HT1070A. In a brightly lit family room, that gives it superior image quality with more saturated color. On the other hand, the HT1070A delivers better contrast, which gives it more robust color, darker blacks, and better shadow detail in a dark room. Unless one has a feature you insist on--like the 3D support or Wi-Fi--you'll want to pick the projector that is the better match for the ambient light level you plan to use it in. The Technologies: DLP vs. 3LCD. The BenQ HT1070A is built around a single-chip DLP engine. The Epson HC 1060 uses three 3LCD chips. These different imaging technologies are responsible for many of the other differences between the two. Like any single-chip DLP projector, for example, the HT1070A can show rainbow artifacts, because it cycles through its primary colors in sequence. The HC 1060 avoids that problem, with its three chips showing all colors at once. On the other hand, inexpensive DLP projectors tend to have darker blacks and better contrast than 3LCD models, as is true in this case. Also 3LCD models typically have a dust filter that must be changed occasionally to avoid dust build-up and overheating. DLP models like the HT1070A don't need one. Lenses. Both projectors offer a 1.2x optical zoom. However they have different throw ratio ranges, so you can position the HC 1060 closer to the screen for any given image size. For a 100" diagonal image, for example, the throw distance from screen to lens for the HC 1060 is 7.25 to 8.75 feet, compared with roughly 9.5 to 11.5 feet for the HT1070A. In a small room, the HT1070A may limit you to a smaller image size than you want. Keystone correction. The Epson HC 1060 has both vertical and horizontal keystone correction and also independent four-corner correction. The HT1070A is limited to vertical keystone correction only. 3D Video. The BenQ HT1070A offers Full 3D support with DLP Link glasses. The HC 1060 doesn't support 3D. Connections. Both projectors offer two HDMI ports, but only the HC 1060 adds MHL on one port for easy connection to mobile devices. It also has two other connection choices the HT1070A lacks. Its USB Type A port lets you read files directly from USB keys, and, based on the menu options, its built-in Wi-Fi allows what should be easy wireless connection to mobile devices and computers. We were unable to establish a Wi-Fi connection in our tests, but Epson technical support concluded that the problem was a bad network card on our particular test unit. We expect this feature will normally work as promised. Total Cost of Ownership. Despite the similar initial cost for the two projectors, the HC 1060 is likely to be less expensive to own in the long run, although the key phrase here is "likely to be." Epson's replacement lamp is an extraordinarily low $49, while BenQ's replacement lamp is $149. Lamp life in Normal (full power) mode is expected to be 4,500 hours on both projectors. However they differ in eco modes. The HC 1060's eco-mode is rated at 7,500 hours. The HT1070A has two eco options - a normal Economical mode at 6,000 hours and a SmartEco mode, rated at 10,000 hours. This isn't an Eco mode in the usual sense. It works much like an auto iris to make dark scenes darker. It also lowers power usage and extends lamp life. Relative picture quality for the BenQ HT1070A and Epson HC 1060 depends on the level of ambient light in the room. Both projectors are rated at "up to" 15,000:1 contrast ratio. In a room with little to no ambient light, however, the HT1070A delivers notably darker blacks, more saturated color, and far better shadow detail. The difference in contrast ratio shows particularly well in images like a nighttime cityscape. Compared with the HC 1060, the HT1070A grays and blacks are far darker, and colors are far more vibrant. The difference also shows well in the darker scenes of a movie like Batman v Superman, which has mostly dark scenes. But even in brightly lit scenes, it helps color look more saturated and gives a greater sense of three dimensionality. Raise the ambient light to more than the dimmest level--in a family room with all the lights on, say--and the advantage flips to the HC 1060, with its much higher brightness. The extra light washes out the blacks on the HT1070A, so blacks and dark grays look the same on both projectors, and it robs some of the saturation from the HT1070A's colors, making them look a little washed out as well. The HC 1060's much higher brightness lets it stand up to room light far better, giving it the more saturated, vibrant color and the greater feeling of depth. Color quality. Both projectors offer four preset color modes. As is typical, the brightest mode in both cases shows a green bias and is noticeably further from neutral than the other choices. However the green bias in the HT1070A's brightest mode is the far more obvious of the two to the point where it is impossible to ignore. I couldn't find any settings that would make the brightest mode neutral enough to consider acceptable for video or photo images. The green bias in the HC 1060's brightest mode is modest enough that if you need the brightness to stand up to a high level of ambient light, you might be willing to use it for photos or video even without tweaking. You can also adjust it for more neutral color with only a small loss of brightness. Each of the other three color preset modes on each projector show either a slight green or slight blue bias. Depending on how critical an eye you have, you might consider any of them usable as is--particularly the ones with the blue bias, which most people don't find as objectionable. Of course, both also let you adjust color. With the HC 1060, I found it fairly easy to get a close match to a calibrated reference projector, starting with Bright Cinema, the HC 1060's second brightest preset. I found it harder to adjust the HT1070A, but managed to get it fairly close to neutral, though not quite as close as the HC 1060. Both projectors offer suitable detail for their 1080p resolution, with crisp focus across the screen and little to no difference between them. Brightness. When comparing lumen readings, keep in mind that the BenQ HT1070A has a Brilliant Color feature which essentially adds white light to the picture in order to brighten it. While extra brightness may often be desirable, a significant white boost tends to dilute color saturation and alter color accuracy. So you have the option to turn Brilliant Color off, which gives you 100% color brightness at a reduced total brightness. This lets you maximize color quality and saturation in a dark viewing room. To illustrate the lumen effect, we have taken lumen measurements on the HT1070A with Brilliant Color both On and Off. Meanwhile, the Epson HC 1060 generates 100% color brightness without any option to boost white for extra brightness. However it is the brighter of the two projectors even without a white boost option. BenQ rates the HT1070A at 2200 lumens, and Epson rates the HC 1060 at 3100 lumens. The measured ANSI lumens for these projectors are as follows. All measurements were taken with the zoom lenses at the widest angle setting. Eco modes. The HT1070A's Economic mode lowers brightness by 28% compared with its Normal mode. The HC 1060's Eco mode lowers brightness by 38%. Zoom lens light loss. The zoom for on both of these projectors' lenses is 1.2x, which isn't a large enough range to curtail light noticeably at the telephoto end of the range compared with the wide angle position. There's no need in either case to take the lens setting into account when choosing a position for setup. Brightness uniformity. The HT1070A's measured brightness uniformity is only 60%, which is low for a home theater projector and easy to see on a solid white or light-color image. Fortunately, most video and photo images break up the field of view, which effectively hides differences in brightness across the screen. In addition, the human eye and brain tend to interpret any differences you see as variations in the original scene. The HC 1060 does better on this score, at a measured 79% brightness uniformity. Rainbow artifacts. Like all single-chip DLP projectors, the HT1070A can show occasional rainbow artifacts, due to its showing primary colors sequentially. Some people find these artifacts annoying; others don't. The HC 1060's three-chip design, which shows all primary colors at once, avoids any possibility of showing rainbow artifacts. Onboard audio. Both the HT1070A and HC 1060 include onboard mono speakers, rated at 2 watts in each case. But HC 1060 wins any audio comparison hands down. The HT1070A delivers much lower volume, making it appropriate for only small groups in a quiet room. The HC 1060 delivers far higher volume, despite the matching spec, and can fill a small family room or serve for a backyard movie night. For a permanent installation, of course, you'll want to use a high quality sound system with either projector. But with the HT1070A, you should plan on using an external sound system even for an ad hoc, temporary setup. Input lag. We measured the input lag for the HT1070A at 33 ms and the HC 1080 at 52 ms. For both projectors, the lag was the same for all color modes and for all settings of video processing features. The difference between the two is enough to make the HT1070A the better choice for moderately serious gamers. Fan Noise. 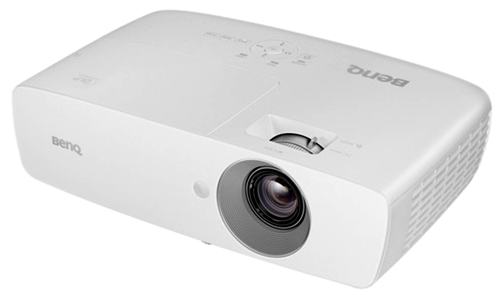 Neither the HT1070A and HC 1060 are particularly quiet, which is typical for portable lamp-based projectors in this size and brightness class. The HT1070A weighs 5.65 pounds, and the HC 1060 weighs 5.95 pounds. Neither includes the extra weight of sound deadening material. In a quiet room, you will hear fan noise with either projector, even in Eco mode. Between the two, the HT1070A is quieter when you compare both projectors in their Normal power modes, which is consistent with their ratings of 33 dB for the HT1070A and 37 dB for the HC 1060. Both are about the same in their Eco modes, despite the ratings: 31 dB for the HT1070A compared with only 28 dB for the HC 1060. The one advantage for the HC 1060 is that it is both quieter and brighter in Eco mode than the HT1070A is in Normal mode. Both the BenQ HT1070A and the Epson HC 1060 deliver excellent value for projectors that cost just $649, and both are eminently portable if you want a projector you can bring to a friend's house or use in the backyard for a movie night. Each is also clearly better than the other for some uses, which makes choosing between them surprisingly easy. If you want or need 3D, the HT1070A is your obvious choice since the HC 1060 doesn't have it. Similarly, if you must have must have Wi-Fi or built-in audio with enough volume to easily do without an external sound system at least occasionally, you'll want the HC 1060. In most cases, however, the right choice will depend on the ambient light level you plan to use the projector in most of the time. In the dark or for dim lighting, if you want more saturated color, good shadow detail, and a better sense of three-dimensionality, you'll get it from the BenQ HT1070A. In a brightly lit living room or family room, however, the clear choice for richer, more saturated color and the better sense of depth is the Epson Home Cinema 1060. Lumen output in Dynamic and Bright Cinema picture modes is up for the HC1060 and down for Cinema and Game picture modes - in comparison to the predecessor HC1040 - as measured by Projector Central.